Home Tags Posts tagged with "Heroes’ Cross on Caraiman Peak"
The Heroes’ Cross on Caraiman Peak, Romania, has received official recognition from the Guinness World of Records as the largest cross on a mountain peak. 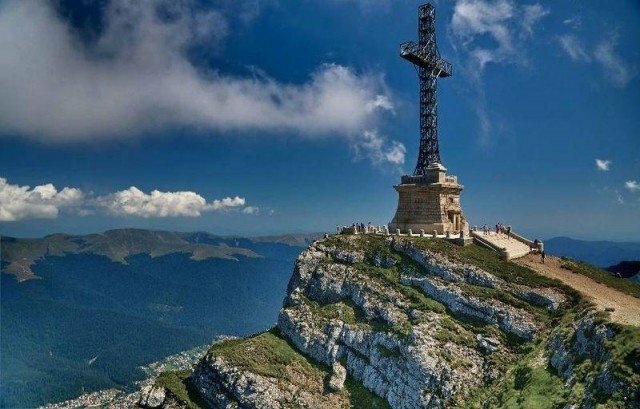 The cross is placed at 2,291 m altitude in the Bucegi Mountains of the Southern Carpathians, according to Guinness World of Records. The Heroes’ Cross was built between 1926 and 1928 in the memory of the railway heroes who died on duty in World War I fighting against the armies of the Central Powers. The monument is popularly known as the “Cross on Caraiman”. The cross itself has a height of 92 ft. The width of the vertical pole is 7 ft, the horizontal arms have a length by spindle pole of 23 ft, and a square cross section with sides of 7 ft. The cross is made out of steel profiles and is mounted on a pedestal of concrete clad with stone 25 ft high. Inside the pedestal there is a room that originally housed the electric generator that powered the 120 light bulbs of 500 W each located on the perimeter of the cross. The Heroes’ Cross was built under King Ferdinand and Queen Mary of Romania.